How to Write Your Goal … plus the No.1 tip to get it! Today I made a HUGE distinction in how to write your goals. I thought I’d share it with you. Before we get going I need to let you know that the number 1 tip for how to write your goal or goals is actually to write them down. I’ve been writing my goals down for years – and getting most of what I set. So let me assure you that learning how to write your goals the right way, and actually writing them down is one of the most life-changing things you can do for yourself. Last year my friend and mentor Paul Blackburn reminded me not only to write all of my goals down in a goals book, but to spare no expense on the book itself. 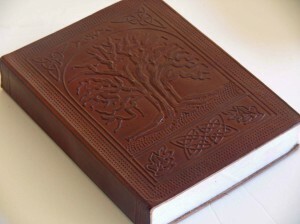 So last year I switched to a more elaborate goals book, a lovely dark brown leather-bound one with an embossed cover. It’s textural, it’s nice to hold and it feels substantial, weighty, like a prized possession where the really important things are recorded. Embossed on the front is a giant tree, it’s branches stretch high into the air above and it’s huge stabilising roots plunge through the ground below. It represents the many different things I do, each being a different branch trying to find its own space in the canopy, and reminds me of my need to stay grounded and focussed. Inside are a hundred or so hand-made paper pages, each with their own subtle flecks of colour. The pages are rough and textural – not so great to write on with a biro or ball point pen, but beautiful to read and feel each day as I turn each page reading through my goals, skipping the ones I have already achieved – which are adorned with brightly coloured success stickers, hearts and stars for a job well done – to re-read the ones I’m still journeying towards. 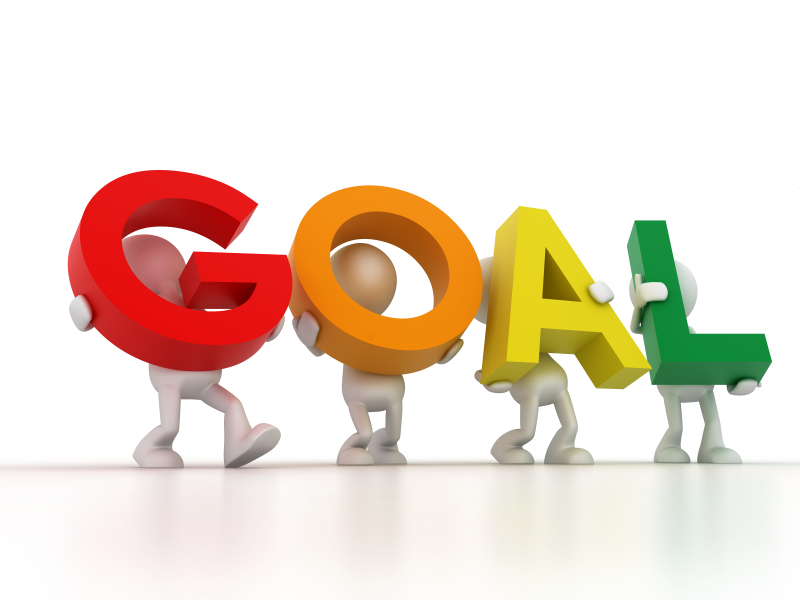 So now you’ve found a special goals book to write in, let me reveal my HUGE distinction in how to write your goal. Recently I decided to return to the workforce, not because I don’t love what I do, but because working predominately on your own is, well, rather lonely. It’s a void not even Facebook, Pinterest and Twitter can fill, no matter how much they may try. I also feel I’m missing a bit of structure in my life. So lately I’ve been yearning to work in a team, with a common purpose, on a mission to add value and contribute to a worthy cause or organisation. And so in January I wrote my goal to this end. Sounds like a pretty good goal, right? I thought so, and I started scouring the Internet for exactly that role. And I found it. The right organisation, the right role and the right money. Perfect! It has been almost 7 years since I applied for ANYTHING and things have changed in the resume and job application space. So first I did a heap of research in how to write my resume and updated it. Then the my perfect job had a number of ‘gates’ to get through. First you had to go to their website and check out the PD (Position Description). The role on the web site had a different title from the one advertised, and as they were advertising 5 roles finding it was the first gate to hurdle. Then their requirements were extensive and very specific … I met them all. Gate 2 hurdled. Then they wanted a Resume of no more than 3 pages (oh boy, mine was 6 so a lot of condensing came next). Gate 3 hurdled. They wanted a ‘no more than 2 page KSC response’. What the heck is a KSC Response? Google to the rescue showed it was a Key Selection Criteria Response and several articles later I was well-educated in preparing one. Gate 4 hurdled. Application complete they then wanted a cover letter addressed to a specific person, and email address not listed in the original job advert. Gate 5 hurdled. I was excited when a few days later they called and asked me to come in for an interview. New suit, make-up perfect, shoes shined, compendium ready and nerves settled I performed very well in it indeed. Gate 6 hurdled. Unfortunately, almost 2 weeks later, they rang with an apology. I’d been pipped at the post coming in second. . Final gate 7 I tripped. My perfect job went to an applicant that had experience ‘more in line’ with what they do. Hmmm, I’m still waiting for feedback from the interviewers as to exactly what that means. So today, now that the disappointment of missing out on my dream job has dissipated, I went back and re-read my goals and I discovered a fundamental flaw in that goal. In my review today I realised I had actually gotten the goal, even though I missed out on the job. And that discovery has led me to write this blog on how to write your goals in the hope that you don’t make the same mistake, so you’re not disappointed or even heart-broken like I was when I missed out on my dream ‘job’. You see my goal was actually open to misinterpretation and reinterpretation. You see what I’d written in my goal was that “… I have found the perfect ‘job’…” not that I was ‘working’ in the perfect ‘job’. So you see I did in fact reach my goal, it’s just the I was not word specific enough in writing my goal as I truly wanted it. It’s the need to write your goals so specifically, so precisely and exactly, that it’s not open to any misinterpretation. Learn this lesson quickly and you’ll learn how to write your goals so that you get exactly what you want each and every time. Now all I’m hoping is this goal is not open to re-interpretation and my dream job is merely 4 or 5 weeks away from being manifested. Want to learn how to write your GOALS more effectively and GET THEM to create the life (or business) of your dreams? Find out below. Personal Values: Deck Chair, or Life-Raft? I love my coaching sessions (yes, all coaches should also have a coach!) I value each session highly, eager to learn more about me. Today was certainly no exception. For me today’s granules of wisdom were all about value and values – how do I add value to others, and how do others value my contributions, not just as a coach, but in all areas of my life including my volunteer work? In fact especially my volunteer work … where there’s often no financial transaction involved and less value is often placed on the contribution. And whilst in these finance-less instances there my be another type of contract, unless there is an actual transaction, a giving AND a receiving, it’s easy to start to feel as though you’re taken for granted and not valued. And that’s when it often all starts to go pear-shaped … we start to ask why, feel resentment and our passion, energy and enthusiasm wanes. And it happens pretty quickly. This needs to be nipped in the bud so as to preserve us, our giving, loving selves, in our unique wholeness. Easier said than done. Well, actually perhaps it’s not. Among all of our ‘doing-ness’ we really need to identify what we really value (or what ‘feeds’ and nurtures us) compared with what doesn’t feed us, but for various reasons we do it because we feel compelled to do so. That is our true personal values, as opposed to what we think we value. It’s the heard, not the heart we need to listen to. Problem is often our head keeps getting in the way. Enter the Titanic – yep that giant ocean liner of wisdom. 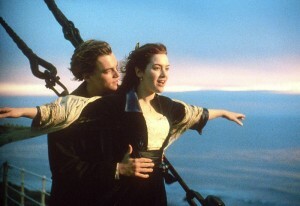 We all know that it’s sometimes said that doing tasks can be simply ‘rearranging the deck chairs on the Titanic’. So when is a task just a deck chair, and when does it become a life-raft? When does what I do (for myself or for others) become something that’s truly nurturing or valued – when does it make my heart sing? And when is it just a deck chair, that can be left alone to weather in the salt spray and midday sun? So then came the REALLY BIG REVELATION: My head thinks my heart is a deck chair, when my heart is really the life-raft. The truth is I’m a cerebral girl, and I live mostly in my head being very practical, rather than in my heart where I should be. I juggle facts and figures, look at the pros and cons, and consider all manner of things to determine the best solution to support the best outcome or the goal being sought. It’s what I’ve done most of my life, especially professionally since I started work at the tender age of 12 doing after school ledger book-keeping. And this so statement, is the crux of my journey as a coach – learning how to be more heart-led, heart connected and whole, and in doing so helping others achieve the same. It’s the very reason I truly admire Brene Brown and Amanda Palmer (more on Amanda later). So enter the Titanic List. Today I started a list of 3 columns headed “Hell Yes”, “Hell No” and “Not Sure”. For a week, I’ll jot down each task as I do them placing them in the “Hell Yes”, “Hell No” or “Not Sure” column depending on how I feel about doing that task. “Hell Yes” I want a cup of tea, “Hell No” I don’t want a cupcake. “Hell Yes” I want to write this blog, “Hell No” on doing my BAS statement (yes, I’m procrastinating again). And opening my mail? “Not Sure”. Depends what’s in it! Remember this is not an excuse NOT to do the task, just an opportunity to discover and explore my personal values. More importantly it’s a gift to see what my heart tells me is nurturing me, and what is not, before I get to ask the REALLY BIG question: What needs to change in order for me to let that task go, forever? But the point is that rather being driven by the task as a ‘to do’ this Titanic List enables me to be consciously aware of whether a task ‘feeds me’ or not in terms of my personal values. And where it doesn’t, I can consider what I might need to do to change its necessity going forward – identify what has to occur for me to never have to do that task again – hopefully in time before I hit the iceberg. So this is all very big stuff. People often go on and on about living the life you deserve, following your passion, fulfilling your Purpose. But the bottom lines is that unless you understand exactly what your heart (or your Spirit as I prefer to call it) truly desires (personal values) and what it needs to be nurtured or ‘feed’ on to be complete, you have little hope of achieving that aim. Last year I was speaking in Thailand on Business Strategy at the start of my presentation I asked a group of students if they knew what their ‘Passion’ was – what got them up in the morning, ready to jump out of bed and leap feet first into the day for. Most in the audience nodded but one student, David, put his hand up and said he had no idea at all. I must admit I was a little taken back … surely there was something he loved to do more than anything else in the world? It was the following day when David came up to me and asked to have a chat in one of the breaks. Within the first 3 seconds he broke down and cried … the emotion was, in a word, palpable. I sat with him for as long as it took. I didn’t speak, I just listened and gave him the space he needed. It took quite a while for him to articulate what he was feeling. It was that he had just worked out what his passion was and what he was here to do. And it was mind-blowing for him. That was a tender and really touching moment, heartfelt and open, warm and fuzzy for all the right reasons. I wish that we all get that opportunity, that ‘a-ha’ moment of realisation of real personal values, when we feel what it is that our heart and not our head connects to. When we feel the exhilaration like Rose did on the bow of the Titanic with Jack, the wind streaming through her hair and the sun on her face. Because it’s when we start to discard our deck chairs and embrace our life-rafts that real magic happens. It’s weird when you learn that someone you knew well passed away without your knowing … two years ago today to be exact. Cleaning up this afternoon (to make Chantal proud) I came across my former acupuncturist’s letter from July 2011, when she told us she had her “own serious health crisis” but was sure that she “would be OK again after treatment and complete rest”, referring Antony and me onto two other practitioners in the meantime. Many times since I have driven by Julie’s shop in Burke Road, Camberwell, looking for signs her practice had re-opened, and wondering if she did indeed recover. So today, for some unknown reason, I decided to send a quick note off to the abyss, knowing if the worst had happened it would come back. Moments later it did – and I knew. As a scientific kinda girl I need know more in order to achieve closure of some kind … an internet search sadly revealed all. I discovered this wonderful, giving and loving woman, who nurtured my body and soul and who never gave it to me ‘sugar-coated’, passed away on 18 February 2012, less than 7 months after her letter. The day she passed was the day we celebrated English Gent‘s 50th birthday with Grace, and the following day we lunched with my parents Ros and Paul, and their friends, Evelyn & Dennis, parents of Paul McGuire. Sadly, Evelyn has since too passed. Time has marched on, so they say, and none so more apparent than looking at a hand written letter of someone no longer here. I could write all sorts of stuff about seizing the day but that’s just not where my head or heart is right now. For me it’s about truly understanding the power of a heartfelt connection. This feeling has only happened to me once before, when another friend, Simon, whom I knew was ill passed away quietly from a very painful form of cancer around 1990. In the weeks before he died he made a conscious act of mentally connecting with each and every person he could remember ever having met. 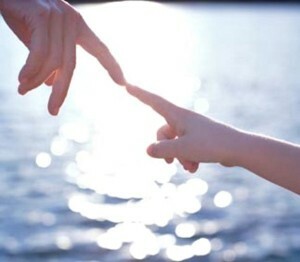 I remember vividly the day he reconnected with me …. And so too, even though Julie’s not here, her words of wisdom (some of which involved gaffa tape) are still ringing in my ears, louder than they ever have before, once again guiding me in the right direction. She had far more impact on my life than I gave her credit for, and so this post is my public acknowledgment, my tribute of thanks for her contribution to me. Yesterday, as President of the Swiss Club of Victoria, I attended the annual Seniors’ Luncheon at our Club in Flinders Lane. 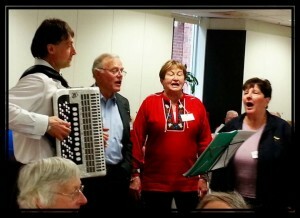 There were about 45 members having a wonderful time, and as most Swiss events go, towards the end of it they broke out into song accompanied by musician Valeri Ozeran on the accordion. Valeri’s smile was infectious, a true showman who made eye contact with every member of his audience and seemed to connect on a deeper level. During the breaks between his performances I got to learn a little more about him. Valeri does more than just play the accordion. He came to Australia from Russia 16 years ago to join the Melbourne Symphony Orchestra to play Double Bass and Violin. He now regularly plays the accordion at The Cuckoo Restaurant in Olinda (owned by his Godmother), and he does a fabulous calling sound of a cuckoo too! But there seemed to be so much more to the jovial and always smiling Valeri … I was intrigued and I wondered what this may be. As we chatted he slowly began to reveal more to me. Valeri is the Author of “The Path to Change One’s Life” distributed by Pan MacMillan Australia into 16 countries worldwide. As impressive as this may sound, it was his philosophy for life that amazed me. How could a man who had seen such poverty under communist rule have a heart so gentle and open that it simply oozes happiness? In a day and age where 1 in 4 Australian adults is on anti-depression medication, has Valeri actually found the path to what it seems we are still all seeking? Valeri starts to explain to me his philosophy. “If you’re not happy you are thinking the wrong thoughts” he says, and goes on to explain how what we think effects how we behave, how we react and the level of happiness we feel in life. Valeri continues for quite a while with so many pearls of wisdom that it’s hard to capture them. He talks about how in searching for our own happiness we need to understand how to express love, and how to express gratitude. And then he says one of the most important things I have ever heard … that “gratitude is the highest expression of love.” And that was it … the last piece in the jigsaw puzzle which explained to me why it’s so important to express gratitude throughout each and every day. In my own search for deep and everlasting happiness I have been practicing Gratitude now for 344 consecutive days … that’s almost a year. Writing it down in my Daily Success Journal and spending a few minutes reflecting on what moves me to feel Gratitude has added another dimension to my life. Some days it’s easy to feel grateful for hundreds of little almost inconsequential things. Other days it has proved more difficult to find that one kernel of deep heartfelt Gratitude. You can feel grateful for your family, husband, a BFF or furry four-legged companion. It might be an unexpected phone call you receive out of the blue, the thank you card you receive in the mail, or simply a kind word of compassion or support. In fact it could be almost anything at all. But that one true thing, that all of these have in common is that they move us, they deepen our connection with others, allow us in that moment to be more open and vulnerable and to feel what we spend most of our lives trying to cover up and protect. Who knows why we do it. But with this revelation it seems completely silly that we try and protect ourselves from the potential of a pain that may not ever eventuate. And by trying to prevent the “bad”, we exclude the possibility of actually feeling at all. We miss out on the presence of true joy, contentment and happiness in our lives. It’s when we allow ourselves to actually feel the emotions we have, whether they be positive or negative, we journey to a better place. We soon pass by anything that we’ve bottled up, even if it’s been for years. And we do eventually reach the destination of the feeling we’re all trying to get to. And that feeling is love itself. So take some time out each day to sing to your hearts’ content, be merry and laugh, hug everyone in sight, dance with abundance, express deep gratitude or simply allow yourself to feel what you feel. You never know, you might just find true happiness. Article written for Adventures in Manifesting (awaiting publication). Read the previous article Part 1 – “Why the ‘bad’ stuff happens” here. Many people have written about the law of attraction, in one form or another, based on Newton’s law of inter-attractiveness, or gravity. It’s the scientific principle that underlies the phenomenon of “The Secret”. But very few, in comparison, have written about Ohm’s law which is just as powerful, perhaps more so. To understand how this law can negatively impact your subconscious and subsequent behaviour we must first understand this law of resistance proposed in 1827 by Georg Ohm. Have you ever gone out of your way to avoid something, but it’s happened anyway? If this scenario has happened once or many times in your life then you’ve probably been left wondering “why me?” Truly it’s not bad luck, the ‘curse’ or any sort of conspiracy against you. Rather it’s simply Ohms Law in action. In the 1999 Movie “The Matrix” Morpheus explains to Neo “If real is what you can feel, smell, taste and see, then ‘real’ is simply electrical signals interpreted by your brain.” So if we exist primarily due to the electromagnetic impulses that surge through our bodies then we can begin to understand how the concept of resistance, and this law, could have a big effect. Ohm, the German physicist and mathematician, observed electrical circuits and proposed that ‘current that passes through a resistor between two points is related to the voltage difference between the two points, and inversely related to the electrical resistance between the two points’. 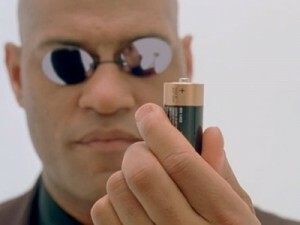 According to Lawrence Fishburne’s character, with the human body generating “more bio-electricity than a 120-volt battery and over 25,000 BTVs in body heat” it makes sense that it’s where we direct this energy – the goals, objectives, tasks and thoughts that we channel it into – that matters. Electricity, or energy, is neither good nor bad. We can use it to give life with a defibrillator, or we can use it to take life in an electric chair. What determines its meaning is the intent behind the energy, and it’s this intent combined with our values that label it destructive or supportive. Just like a battery, there are opposing choices in our human circuit: positive or negative. 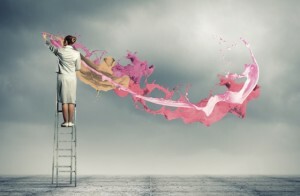 When we direct our energy into negative or destructive thoughts about what could happen, we conjure up all sorts of horrible scenarios, filling our conscious mind with images and thoughts. And it’s those very scenarios that with enough thought soon spill over into the subconscious mind, which is what drives our ‘automatic’ behaviours. The subconscious is a very powerful thing – just like an Aladdin’s lamp it will give you everything you ask for. 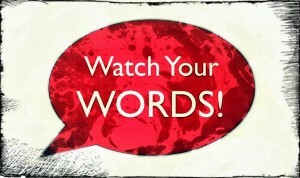 But it also takes you literally, personally and doesn’t process negatives – every statement you make, verbal or otherwise, has a direct impact on your results. A negative statement like “I don’t want to be late” is interpreted as “I want to be late”. A negative thought like “they want to be broke” may be interpreted as “I want to be broke”. And a throw-away line like “I’m ugly” is taken literally despite your beauty. The old adage ‘be careful what you wish for’ reminds us to take more care with our language, our words and our thoughts, because we just might get exactly what we ask for. My favourite summary of Ohms law are the words “what you resist, persists”, and it also explains why resistance really is futile – just ask Star Trek’s Borg! The upshot of all this is that we need to learn how to control our negativity in order to boost the manifestations of our goals, just like turning on a light bulb. And that’s exactly what we’ll be discussing in the next article, ‘Flicking the Switch’. Article written for InShapeNews. See the original article here. Need more Time or Energy in Your Day? Is it realistic to think we can be fully energised, focussed and involved in all areas of our lives, and still have time for ourselves at the end of the day? 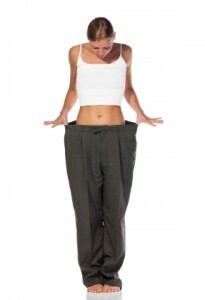 International Authors and Wellness authorities Sigrid de Castella and Pete Jensen believe the answer is “Yes” and they have the proof: Sigrid lost 70kg naturally to reclaim her Health; Pete recovered from severe depression to find his way back to Happiness. Harnessing their combined experience and expertise, Pete and Sigrid have created a powerful 1 day holistic experience that will allow you to take stock of your current energy levels, find the missing pieces of your energy puzzle, and help you build a sustainable plan to find health, happiness as well as more time and energy in your day. This is not another one of those boring seminars. It’s a hands on event packed with leading edge information, tips, strategies and…….fun! Our intention is to give back to our local community, so we’re running this introductory one day workshop at cost. This means instead of paying $497 we are offering this event for a significantly reduced investment. And friends and partners can come along for 50% off once you book. Tickets: $97 includes your choice of book valued at $29.95. Further discounts apply, see web site. If you’re stuck in a rut and need to find a new way forward the this is the workshop for you! If you’re unhappy or dissatisfied with life, then this is the workshop for you. If your health isn’t all it could be and you want to know the keys to regaining it easily, then this is the workshop for you. 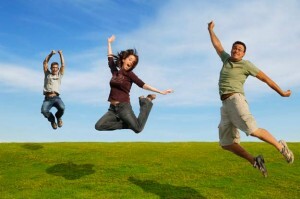 We guarantee we can help boost your health, happiness, and energy levels so you get more out of life! So if, after attending the workshop, you don’t believe you’ve learned anything that can help then we’ll refund your ticket price in full, and you can keep the book as our gift to you. Article wriiten for Adventures in Manifesting. Read the original article here. With access to so much information to teach us how to attract great things into our lives why do only a rare few achieve the sweetly perfumed bed of roses we all seem to be seeking? Jealously we look on to see others enjoying a perfect life while we nick ourselves on its thorns. No matter how hard we try to avoid or change it bad things can and will happen. As single events we tend to recover quickly but when we’re in a downward spiral things seem to keep going wrong, one after another like a never ending stream of crappy karma. And we wonder what we ever did to deserve it all. It can start with a simple forgotten task like setting the alarm clock. Some mornings you recover and get back on track, but other days the morning minutes evaporate faster than water from the Sahara sands. You miss the bus and end up driving to work in gridlocked traffic and then you realise you’ve left your mobile phone. Before the day has really started you just know it’s going to get worse. If you’ve ever had a day like this then you know exactly how it can feel: you’re in one of those ‘moods’ and, despite the best efforts of colleagues to cheer you up, nothing is funny anymore not even Stewie’s attempts to kill Lois or Brian’s penchant for getting drunk on martinis. All you can see is a mountain of paperwork and the usual office hum that keeps you motivated is starting to annoy you. You tell yourself you’re just having a bad day, week, month or year. Could this be an unlucky phase that will soon pass or could there be something deeper and darker at work that’s conspiring to make your life more arduous than climbing Mount Everest in a blizzard? Others tell you to think happy thoughts and everything will be fine (and if you know what the acronym FINE stands for you may actually agree). But this approach to resolving the downward spiral in life will rarely work for very long, if at all – we’re emotional creatures and it’s just not that easy to flick the switch. The ‘bad’ stuff does not happen to balance out life’s finer bits or to help us appreciate the good times. For the most part we attract bad things because it’s what we’re trying to avoid. In other words it’s what we’re resisting that’s persisting in our lives. It’s a scientific principle called “Ohms Law” which I’ll explain in more detail in the next article “Why Resistance Is Futile”. In his groundbreaking book,’ The power of full engagement’, Dr Jim Loehr, co-founder of the Human Performance Institute, maintains that ‘Managing energy, not time is the fundamental currency of High Performance”. For many, the challenge is trying to maintain full energy, focus and engagement in all areas of our lives, like work, home, and relationships, and at the same time make time and energy to nurture ourselves. Anecdotal evidence suggests that depression, stress and anxiety are on the rise in the workplace, and also at home. Modern, busy lives often mean that maintaining our health as well as our happiness is becoming a struggle in itself as we try to give equal attention to our physical, emotional, mental and spiritual wellbeing needs. Is it realistic to think that we can be fully energised across all four areas? 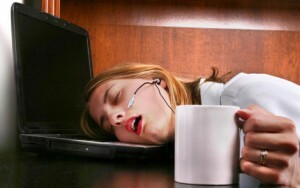 What’s the impact when you, your team members or family members are lacking in Energy? Based on their personal experience and years of research, co founders of Real Health and Happiness (R2H) Pete Jensen and Sigrid de Castella, have created a holistic approach to solving the personal energy puzzle. Say’s Pete, “When it comes to personal energy, some people have the Health puzzle complete, yet aren’t truly Happy. Others are very happy, but the Health piece of their puzzle is missing, which will impact their energy in the long term”. R2H provides the knowledge and tools to achieve both and live a daily, energised life! Why the ‘Real’ in R2H? Harnessing their combined experience and expertise, Pete and Sigrid are presenting a 1 day workshop on the 25th of May 2013 that will allow you to take stock of your current energy levels, find the missing pieces of your energy puzzle, and help you build a sustainable plan to ensure your success. This is a wonderful opportunity for your team members or personal network. Sigrid de Castella – An international author and weight loss expert, Sigrid lost more than 70 kg naturally, and reclaimed her life. An expert in the area of Health and Wellbeing, Sigrid shares her secrets, knowledge, skills and tools to guide you on a journey to sustainable health. Pete Jensen – A global consultant and personal transformation expert, and with an intimate knowledge of the latest psychological teaching and tools on Happiness, Pete remained stuck in a long depression, until he rediscovered 3 age old proven core ingredients of Happiness which enabled his recovery and the successful life of adventure he enjoys today.